be quiet! introduces the Dark Power Pro 10, a new line of power supplies available in 550W, 650W, 750W, 850W, 1000W and 1200W editions. These units offers 80Plus Platinum efficiency and promise an efficiency of up to 94 percent. Pricing ranges from 135EUR to 279EUR. be quiet!, market leader for power supplies in Germany for six years in a row*, announced today the release of its new high end line of PC power supply units (PSUs) called Dark Power Pro 10. The flagship series now uses state-of-the-art power conversion and cooling technologies along with other design enhancements to be the quietest and most energy efficient models in the company’s 12 year history. The range features six models all with a modular cable management system and power outputs from 550 to 1200 Watts. Dark Power Pro 10 series all use be quiet!’s renowned SilentWings® fan; the key feature in a completely redesigned cooling system with a new and custom made 135 mm fan. This fan features a fluid dynamic bearing (FDB) which provides a 300,000 hour lifespan and makes it virtually inaudible. 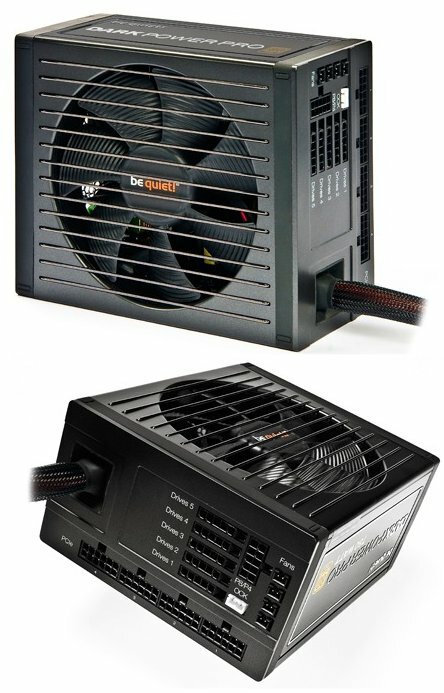 Furthermore using very high quality fans enhances PSU reliability as fan failure is by far the most common failure mode for power supplies. Silent operation is additionally achieved via painstaking optimizations which have minimized all forms of noise—acoustic, electrical and mechanical. In addition the fan grille design and mounting were both fine tuned during design for quietness.